Settle in front of a masterpiece as you view movies and Netflix series that you love. 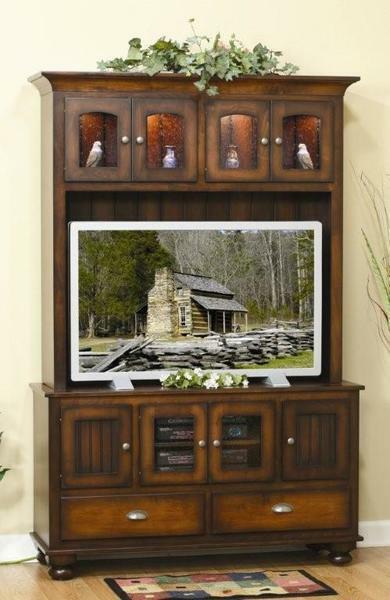 The Amish Cable Mill Cantilever Flat Screen Entertainment Center with Drawers is Amish made with gorgeous solid wood and premium features. The Cable Mill is shown here with a coffee brown finish with a distressing technique called burnishing. Burnishing leaves the outer edges of a piece of furniture dark and the body of the piece a lighter shade. Burnishing can be done by hand or with a tool. The Cable Mill features a row of cabinets across the top, an area to showcase your television, four lower cabinets and two lower drawers. We can build a custom entertainment center just for you. Our Furniture Specialists are available by phone or email and welcome your custom requests. Talk dimensions, wood types, or anything else you're hoping for in a new entertainment system. We thank you for shopping DutchCrafters, the #1 online retailer of Amish furniture.